When investing in buy and hold rentals, the general thought is to splurge on upgrades for higher-end rentals, and not splurge on lower-end rentals because the “returns” are not so great. However, today I want to explain that there are “softer returns” when investing in a lower end price range that are just as valuable as the “hard returns,” especially when it results in faster rental times and fewer turnovers. 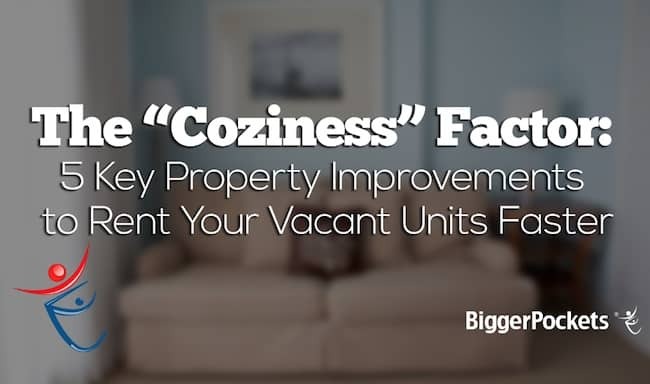 I use a few metrics to obtain my “coziness factor” that includes upgrading your painting, appliance, and fixture schemes. Agree with everything you said, it’s what makes your unit stand out from the dirty, dingy competition. I would add smell also. When someone walks in they should say, Oh it smells nice in here. I do this with an inexpensive glade plug in or two. If you can locate it near a cold air return it will circulate the smell throughout. Added to the list 🙂 Its amazing how much trust can be established with pleasant scents. Great input! Nice tips Lisa. Even though I’m not a landlord these sound like good ideas to make your property stand out. Note on SMELL: I agree that you don’t want your unit to smell like mold or cat pee. But REMOVE the source of your bad smell, don’t rely on products to cover it up! Using things like Glade air fresheners can backfire big-time, making many people nauseous, and in the end if something is making a bad smell it will surface anyway. Just something to keep in mind. :-). Yes — I go with an apple cinnamon AirWick freshener that plugs in. I don’t like the flowery smell because not everyone likes every type of flower. But apple cinnamon seems to appeal to everyone — men and women. I completely agree with you on the paint color issue. I hate white walls myself, and a little bit of color goes a long way. I tend to stay with colors that can match any color scheme. A brown color matches the following: reds, oranges, yellows, greens, turquoise, black, white. I think the only colors the brown doesn’t match well with is purple and maybe navy blue. Most tenants I have like reds, oranges, and yellows. Outlets and switches being changed out also are really good small changes that make the place look new. I go with a shiny wallplate that is easy to clean. Keep your units clean! I can’t believe how many people comment on how clean and how good my units smell. Something little like that really makes a difference. Yes! I feel these are the small differentiators that give such a WOW impact, and once you fine scents/colors/outlets that work, its such a small input that has really high returns. And, my brown/tan color is a hit every single time, so I just re-use it in all my rentals. yellows is a great color too. Thank you, Dawn! Great advise on the outlets and switches, I do the same. The registers and return air vent cleaned and painted or replaced if need be also adds to that new and clean feeling. Lisa, Thanks for the great tips! What color paint exactly do you use? What brand do you recommend? Great vlog, Lisa! I agree with the list – not that hard to do, and they make such an obvious, visible difference. I haven’t gotten brave enough to go for a deeper hue, but a very pale tan or antique white have seemed to be popular. Simply having a contrast between trim and walls is an easy touch. It’s a little scary that a deep cleaning can be a contrast with other rentals, but it’s true. Since you need to perhaps be a bit pickier with tenant screening than with upper-income properties, anything that differentiates you and appeals to the best-performing tenants is a good thing. Ben, thank you! I prefer my soft brown color, or even a yellow, but if there is a nice contrast between trim, that can really perk the place up. And yes, for these areas you really are through your small touches appealing to a tenant that appreciates a nice house. You can see in how quick the applications come in. This is such a great post, Lisa. Why not spend a tiny bit extra and attract quality tenants that will love (and treat!) the place like home. Experience has shown when you deliver a product tenants feel lucky to get, they are more prone to have pride in renter-ship. One more thing is to add new hardware in the house. Door knobs, cabinet handles, a nice place to hang their towel in the bath. Little things like that cost $100 but the shine stands out. I typically invest in homes that are 50-60 years old… often they have the original hardware. A simple change like this goes a long ways. Its soo true,and I have found even when I can use “stock” items for cabinet handles and door knobs, and it completely upgrades/modernizes the look for such a little investment. Exactly. I just added the 99 cent cabinet knobs and changed all the interior door knobs with the $8 ones from HD. Make everything look fresh and clean. Did one 2 hour open house and found the “right” tenant (hopefully at least!) Of course the price was right and I pretty much do the other things you talked about as well. For those discussing what paint color, I have found good luck with gray beige from the Olympic line at Lowes or Popular gray from SW. Mix this with extra white oil based paint on the trim and things look very clean and warm! Going the extra mile to get new paint with a little contract from the wall tone on the trim makes the biggest difference to me. Im sure this is as good as the rest. I’ll view it this evening. Living in the area (lower-end) of my rentals i tend to splurge on upgrades inside and out as a way of building the community. Knock on wood – I haven’t had any backfires from doing so yet. Tim, I do the same! I get the house for so low that I can afford to slightly upgrade for a sleeker look. I mean, why not? For how little it can cost you get a 300% return on investment. Great article Lisa, doing these things will usually set you apart from most landlords in this price range! Which = $$$ for you and a better living experience for the tenant, awesome! It ESPECIALLY goes a long way in this price range, which is exactly what you want: To be the nicest home in a working class neighborhood.